A new Witcher 2 patch is out, bringing a slew of updates and improvements, and another piece of free DLC. CD Projekt Red has put another big Witcher 2 patch out the door and while it's not normally my business to make noise every time a game is updated, The Witcher 2 gets special attention because this isn't just a patch, it's DLC, too! The new 1.3 update brings several improvements including tweaks to the Prologue difficulty level, support for a wider range of aspect ratios, HUD-free screenshots, better support for 3D Vision, SLI and Crossfire, and a pile of other changes and fixes. Also in the mix is A Sackful of Fluff, a new quest that takes place in the second chapter of the game. 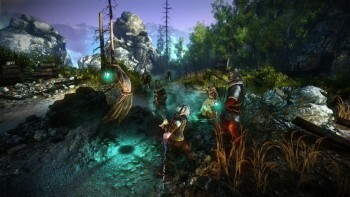 Players must visit the eccentric Elthon in his hut near the quarry outside Vergen to begin the quest, which will "prove most rewarding to those who demonstrate patience." Other fan-requested updates to the game include item storage at inns, a "junk" panel in the inventory that will aid in item classification, the ability to view cutscenes from the menu and the addition of a "Quickload" option. Fresh installs of The Witcher 2: Assassins of Kings should automatically update to version 1.3, while manual links to update existing installs and a full list of changes can be found at thewitcher.com.